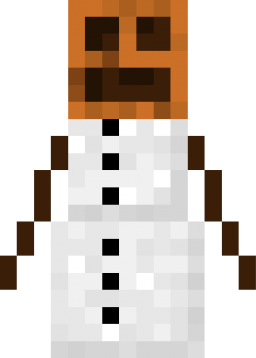 Snow golems (or snowmen) are a neutral mob in Mine Blocks. They will throw snowballs at hostile mobs, or monsters, keeping them back. If the player hits a snow golem, it briefly starts throwing snowballs at the player. Snow golems are created by placing a pumpkin on top of two snow blocks. Snow golems are 2 blocks high with a snow body, coal buttons, stick arms and a pumpkin head. The snow golem and the ender dragon are the only mobs that never despawn, in any difficulty, until killed. Since Update 1.28, snow golems will leave an snow trail in the blocks that they walk in. Although aggressive snow golems shoot snowballs at players, the player will not be hit by the snowballs thrown by them. This may change in 1.29, however. This page was last edited on 8 March 2019, at 14:30.